Some teachers teach from virtually the same notes they have used for years, never having sought any experiences outside the classroom. Larry "Jungle" Shortell of Connecticut is not one of them. "Without a doubt, to travel and learn things firsthand is the best way to understand the world and our place in it," Shortell says. "I hope that others can see the possibilities that open up when one lives life by following his or her dreams, fearing the inability to follow one's passions rather than fearing death." Travel became a lifelong passion for Shortell about 20 years ago, when a close friend drowned and he nearly did, too. He said it was a "turning point" in the way he lived his life. In his day job, Shortell teaches special education in Enfield, Conn., USA. But he spends his summers traveling. He has explored all 50 states, all seven continents, all the oceans and more than 80 countries. He has circumnavigated the globe twice and plans to again next year. 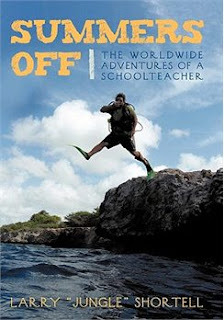 Get a copy of his new book, "Summers Off: The Worldwide Adventures of a Schoolteacher"
If you would rather not receive future communications from Author Solutions, let us know by clicking here.